Super Hero Boy: Dr Seuss bigger than ever! Dr Seuss bigger than ever! Can you even imagine a huge.. and I do mean HUGE elephant floating in the Macy's Thanksgiving Parade? For the first time ever, Horton, one of Dr Seuss's most beloved characters will be joining the ranks of some of America's favorite characters in the Macy's parade. It was a holiday tradition to watch that parade every year when I was growing up and sadly I haven't seen it in years but just the thought of that big elephant floating through the city will have me watching this Thanksgiving. I used to sit and wonder what it must be like for people in the tall buildings to see those big balloons floating by. 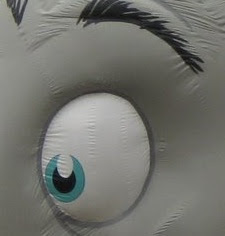 This sneak peak picture really reminded me of that, could you imagine seeing Horton's big eye staring in at you if you were sitting by the window? heh. Speaking of Horton the DVD release of his movie will be out soon, on Dec 9th to be exact. If your looking for a great Christmas gift for a Dr Seuss fan in the family or really any kid big and small in celebration of Dr Seuss's Horton Hears A Who release there will be a limited edition set that includes not only the movie but an adorable Horton plush as well. That's two gifts in one and you could always watch the movie now and put Horton in a stocking for Christmas or vice versa. Personally I'm not sure if I could resist waiting to see the movie that long as we missed it in the theater so I'm anxious to see it but I'd most certainly be putting our Horton plush in Connor's stocking. I have a feeling this set will be awfully popular so if you want one go place a preorder on Amazon! In honor of Horton's place in this years Macy's Thanksgiving Day Parade we will be giving away five really cool gift sets to five lucky readers. 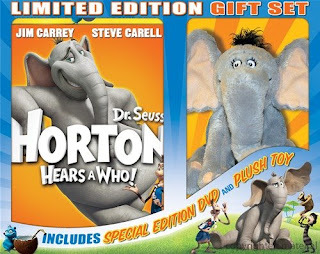 Each winner will receive their very own Horton Hears A Who limited edition set that includes the movie as well as the Horton plush and a set of their very own Horton Ears. 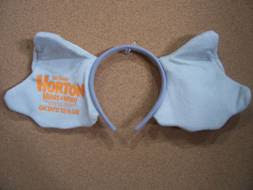 Yep.. Horton Ears... heh. Watch for the Horton Hears A Who review we will be doing here shortly too! Leave a comment on this post. Check out the Horton Hears A Who gift set and tell me which Dr Seuss book is your very favorite! There are sooo many great Dr. Suess books. One of my favorites is "Oh the Places You'll Go", another favorite is "Hooray for Diffendoofer Day!" Hop on Pop has always been one of my favorites. My favorite Dr. Seuss book is "Oh the places you will go." I love giving this as a graduation gift! Thanks for the giveaway! It's hard to choose, I don't even remember the titles. My favorite is probably "The Cat in the Hat". Green eggs and ham, for sure! Go Dog Go :) I read it so many times as a little girl it practically fell apart on me. My mom still has it, too! My two favorites are Green Eggs and Ham and Hop on Pop. My kids love reading them! oh we LOVE Dr. Seuss here! Picking a favorite it hard. Our favorite Dr. Seuss book is Yertle the Turtle! I love the cat in the hat. Our favorite is "green eggs and ham", thanks for the great giveaway! One of my all time favorites is One Fish, Two Fish, Red Fish, Blue Fish. I loved marvin k mooney will you please go now. I gotta go with Hop on Pop. It's definitely a fave at our house right now because I have a beginning reader and this book is great for her. Thanks! I'm also an email subscriber, thanks! We love Cat in a Hat. Thanks! I like The Cat In the Hat Comes Back best. I love the Horton ears that come with this DVD. I just know kids would run to put those on every time they watched the movie. But they'd have to pull them off Mommy's head, I think. I love so many of them but I think Green Eggs and Ham a little bit more than the others. I can't wait to see Horton Hears A Who. I keep forgetting to put it on my Netflix list. My favorite is "Green Eggs and Ham"
We love the Foot Book in our house! When I was a little girl, my favorite was "Bartholomew and the Oobleck". Thank you! The digging-est dog was my all time favorite! Green Eggs and Ham is my fave! "Oh the Places You'll Go..." is my favorite for the sheer emotion of it being his last book, and I got it on graduation. Very meaningful to me. Green Eggs and Ham is my favorite and my kids love it too. Thanks for this giveaway. Love Green Eggs and Ham...my favorite hands down! My favorite Seuss book is The Cat in the Hat. Thanks for this great giveaway. My favorite is the Cat in the Hat. Thanks for the giveaway! All the Places You Will Go! It's a great story about life with a crazy Dr. Seuss twist. My kids favorite was "Go dog Go"
My favorites are Green eggs and ham and The Cat in the Hat! The Cat In The Hat will always be my favorite. Thank you! My favorite Dr. Seuss is Oh The Places You'll Go! It is such a very special book! I like Cat In The Hat!! Thanks for your giveaway!! The foot book, and green eegs and ham!! My favorite is Green Eggs & Ham! what an amazing giveaway! I've been wanting to see this! :) I LOVE Go Dog Go! My sister learned how to read with this book and it brings back lots of fun memories! Green Eggs and Ham has always been my #1! actually to tell you the truth, i loved them all. seemed like i read the cat in the hat more than the others. my mom had the entire collection for me. i really miss those times. the 70's were the best decade. looking back, i loved it. wish i could go back. brings back lots of good memories. I really, really liked Wacky Wednesday when I was a kid - It's a little different style because he co-wrote with someone else, but I always liked all the crazy stuff that happened. I've always loved Green Eggs and Ham. Thanks for the giveaway. Green Eggs and Ham and The Grinch Who Stole Christmas are favorites, but can't think of one that I really don't like! I Love Go Dog Go! There's one scene with all the dogs sleeping on the bed and one dogs peeps are wide open, then they all wake up and the awake one is sound asleep. Too cute! You know, I love them all. Particular stand-outs are "Oh The Places You'll Go," "Horton Hears a Who," and "The Lorax." My oldest, Erin, was actually in a school production of Seussical the Musical, which is in part based on Horton's story. I'm sure she'd love to have a copy of the movie! The Cat in the Hat is my favorite Dr. Seuss book! i love the book "oh the places you'll go" because it is such a positive book that basically says you can go and be anything you want to be. great book!! Dr Seuss' "The Eye Book" is our family favorite! Thanks! Hop on Pop is a favorite on mine! I STILL love The Foot Book. Green eggs and ham - it's the only one I'm familiar with. The Cat in the Hat and Green Eggs and Ham. I am ashamed to say I know each of the by heart! I love "Green Eggs and Ham" ~ always one of my favorites! I have always loved "Oh, the Places You'll Go!" Such a great book and it is relevant to children and adults. GREEN EGGS AND HAM. I do not like green eggs and ham, I do not like them, Sam I Am! Yertle the Turtle is a hit over here, especially at bedtime! My favorite is Green Eggs and Ham. Thanks for the contest! I love Dr. Seuss books!My favorite is actually Horton hears a Who, after that I would say Cat in the Hat and Green Eggs and Ham. I like Mr Brown can moo, can you? "Oh The Places You Can Go" followed by "The Cat in the Hat"
I love " Oh the places you'll go"
My favorite Dr Seuss book has always been The Cat In The Hat. I think my favorite would have to be The Lorax because of the message. For fun, it would be One Fish, Two Fish, Red Fish, Blue Fish. The Cat in the Hat for sure! I grew up on Dr. Seuss. So many titles, but I think my favorite was Go Dog Go! Thank you for the great give-away. My son loves, "it's not easy being big", thanks so much. i love "I can Lick 30 Tigers Today"
Marvin K. Mooney is one of our favorites. I like "Mr. Brown Can Moo! Can You?" It is my son's favorite Dr. Seuss book. I read about the Green Eggs and Ham and then I eat them! Green eggs and ham. Son's favorite. McElligott's Pool is my favorite. There's also a great Seuss Memorial Sculpture Garden in Springfield, Mass. My favorite Dr. Suess book is Green Eggs and Ham. I remember reading it when I was little. My son has 2 favorites, Green Eggs and Ham and Fox in Sox, which is really hard to read out loud! My favorite is "Are You My Mother?" My favorite is the Lorax but my son loves There's a Wocket in my Pocket!! This is such a fun giveaway! I would luv to see those ears on someone! I love Green Eggs & Ham...it's a classic! I'd love to see the "Horton" movie - it looks so cute! My fave is Green Eggs and Ham. Green Eggs and Ham!! I think that book caused my stubborn streak! Thanks! The Grinch who stole Christmas. Love that book! My favorite is "Oh, the PLaces You'll Go", I received it as a gift for my HS graduation. My kids' fave is "How the Grinch Stole Christmas" because... well, because it's about Christmas! Their favorite holiday. Green Eggs and Ham is a favorite of mine and my son loves The Cat in the Hat. My little guy always loved "Pants with Nobody in Them". Thanks fo the great giveaway! I love reading Hop On Pop to my kids. I'd love to win this for myself! (Okay, my girls too, but mainly for me. hehe) My favorite Dr Seuss book is hands down The Sneeches. I have loved that one since I was a kid. My favorite Dr. Suess book to read to my grandson is Green Eggs and Ham. He just loves Dr. Suess books. It's hard to choose just one, but I'd have to say "Thidwick, the Big-Hearted Moose." I like so many: Go Dog Go, Green Eggs and Ham, Hop on Pop, etc! Favorite book hands down is Cat in the Hat. I have read it sooooooooo many times! One Fish, Two Fish, Red fish, Blue Fish or The Cat in the Hat! I love them both! My favorite would be one fish, two fish. Thanks for the chance.